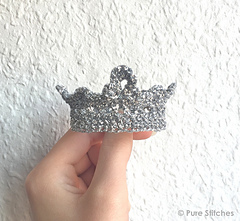 Top Crown is an elegant and fine, little accessory originally suited for a stuffed animal, but can also be used as decoration in a baby/children’s room or sized up to fit a baby/child. With the suggested yarns the crown will measure app. 2 inches (5 cm) in diameter and app. 1,5 inches (4 cm) in height. Using other yarn and appropriate hook you can make the crown in what ever size you’d like. The pattern has been tested by other crocheters, who said it was a quick pattern with good instructions. There is lots of pictures to help you get an understanding of the ongoing work.